The wait is finally over for all who have been eagerly waiting to get to see the queen of Saratoga Entertainment Group, JL Inc. & Shady Blue Inc. family, affiliate artist, the multi-award winning singer – songwriter, Shady Blue. 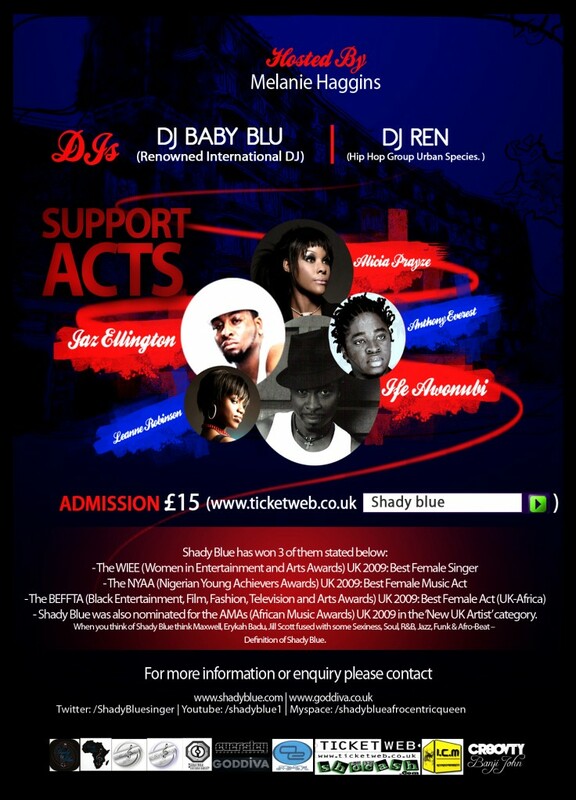 Shady Blue will be headlining a unique one off industry-only showcase concert which will actually be acutely accessible to the public. This will be her little thank you to those who have supported her throughout her musical career and have not been able to see her in the flesh performing live! 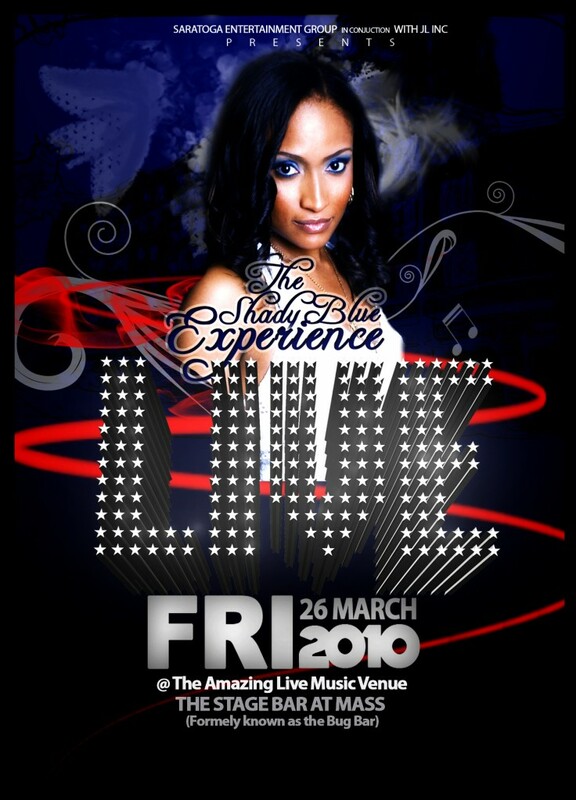 “The Shady Blue Experience Live” will be held on the 26th of March in Brixton at Mass, formerly known as Bug Bar :http://www.mass-club.com/gallery.html. Supporting acts confirmed so far are the London-based, Ne-Soul Star, Jermain “Jaz” Ellington, Rochester, Kent-based gospel and soul, singer- songwriter Alicia Prayze, singer-songwriter Ife Awonubi, Jazz singer Anthony Everest and the finalist of 2010 Reality Trust Search for A Star and Brit Idol finalist Leanne Robinson. Music on the night at star-studded “Shady Blue Experience Live” after party will be supplied by the internationally-renowned London-based DJ Baby Blu, alongside DJ Ren famously known as Renegade - former member of the Electric British Hip -hop band best known for several hit singles during the early 1990s – Urban Species. The event will be hosted by top London Radio and TV Presenter, Melanie Haggins . The Limited Edition £15 Deluxe Standard Edition tickets available now are running out fast at this prestigious guest list only event, with retail at £20 for the guest list requested Platinum Edition Tickets a week to the event. This entry was posted by BEFFTA Editor on March 14, 2010 at 9:33 pm, and is filled under NEWS FLASH. Follow any responses to this post through RSS 2.0. Both comments and pings are currently closed.